Usually, when you are shopping for a new car, you are planning on financing it. While it is always best to pay cash for your car, that's not always realistic. So if you're going to borrow money to purchase a car, it's important to shop around for the best loan possible. Many people automatically assume that your best option for a car loan is at the dealership, but you can often find better rates elsewhere. Once you decide that you want to buy a car, you should determine how much you can afford to buy. Ideally, you should be able to pay off the car in three years. This cuts down on the amount of interest you'll pay over the life of the loan and may prevent you from becoming underwater on the car – in other words, owing more than the car is worth. And it's similar to a home loan. You may qualify to borrow more money to purchase a nicer car, but that doesn't necessarily mean you should borrow more money. You do not want to deal with not being able to afford to make payments on your car because of a shift in finances. It is better to be very conservative in how much you choose to spend on a car. Call your local credit union and see if they will pre-approve you on a loan and what their interest rates are. You can also contact your current bank. These institutions may offer lower interest rates if you have an automatic payment drafted from your account. Be sure to check on this, as well as other discounts that they may offer. It is important to take the do your research. Then, take the rates you've sourced and compare them with the dealership's rates. Then, choose the best offer. Additionally, you should look into all of the possible ways to save on your loan like setting up an automatic payment or switching banks to qualify for the lower rate. During the pre-approval process, you may be required to provide proof of your current source of income. If you are not required to do this to receive a pre-approval, you should be prepared to do this at the time you sign the loan. Some companies are very strict on this procedure, and others are not. If you do not qualify for a car loan, you will need to save up and purchase the car with cash. This may limit your options when purchasing a car. Once you have been pre-approved, you can start the fun part of the process – shopping for a new car. Take the time to look for the best car available, and don't be afraid to negotiate a lower price. 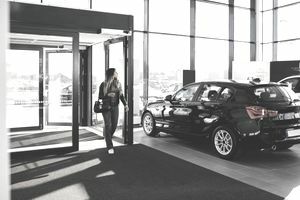 When you are able to secure your own financing, you may be able to get a better price because you have leverage and aren't depending on the dealership for financing. When shopping for a car, you may be tempted to trade in your old car, but it will likely be more financially beneficial to sell your old car on your own and apply those funds to your new down payment. You also shouldn't roll your current loan into your new one. This will likely cause you to go upside down on your new car, which means you'll owe more than it's worth. Buying a car is not an investment. Remember that when you buy a new car it depreciates quickly. You lose money the second you drive it off the lot. You should shop for a used car to save yourself from taking this loss. This one of the common mistakes people make when buying a car. Leasing a car may not be the best option either. Don't be afraid to negotiate the price. Since you are not financing with the dealership you may be able to get more money off, since they are not taking a risk on lending you the money. This can save you quite a bit of money. Additionally, you should have the car checked by a mechanic, especially if you really don't know anything about cars. This will prevent you from buying a car that will need a lot of repair work or that has been in a serious accident. Be ready to have car insurance as soon as you purchase the car. If you already have car insurance, you can call to add the car to your existing policy. If you do not have an existing policy, you will need to set one up before you purchase the car. Some people plan on rolling their old loan into their new one, but this is a bad idea.